No, it is not a bird - just your everyday hoisting machine set against the afternoon winter sky. I just like to keep things simple. PS Have a nice week-end! You got me with the title, I chuckled when I saw the subject. Those lights look pretty interesting suspended in the sky. I have to agree with Wayne, you got me with the title at first, too! I love it! Really interesting capture and the lights caught my eye, too! Hope you've had a good week, Rune, hopefully a great weekend! Ah yes these cranes are quite common here too. Flott bilde, passende både for "Himmelsk" og "SkyWatch"! Ha ei flott helg, - nyt fredda'n slik den skal! Your crane is even better than a Grus grus. I love those colors. Well, I certainly cannot claim to be an expert on photography, but I must admit that this picture was very interesting to me. The sharp detail of that "common crane" was quite effective with that (at least to me) unusual sky in the background. I would say that this one maybe should be hung in some eclectic photo gallery. Likte dette jeg også.Sier som Rema-reklamen,"Det enkle er ofte det beste". As simple as a line drawing...excellent! Og et nydelig bilde ble det! After my geese, I was also ecpecting a bird! During my last 11 years of working, I think these was always one or more in view from our building. I'm sure that not so much common cranes are pictured in such a dramatic way! The real photographer is the one who knows to magnify every day things..
You got that right, RuneE. I gambled that the free package of cigarettes the Army gave me each day in my package of C-rations, would never end: that I would love them, be thankful for America's generosity and set back and puff away in a foxhole on the black cinder beach of an Iwo Jima or the mountains of North Korea. Instead, I gambled and got two shot lungs, heart disease and about outdone my list of miracles—that I am still alive is, perhaps, my last miracle. Gambling on the arts is a worthwhile occupation, but I been there, for years, as an artist and did all that stuff and about all it got me was a sensitivity to linseed oil and turpentine. I was around, at all the shows before artist's acrylic paint came out. Hello my friend, hope the medication is doing its job. Nice shot by the way. I do hope that you are continuing to feel better and better. I wanted you to know I'm thinking about you and hoping that each day is a better day for you. 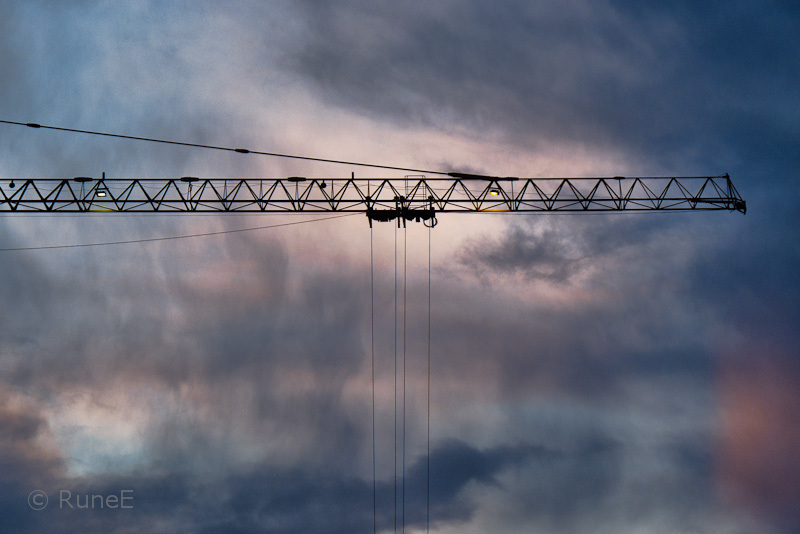 That is one great sky, and the crane makes a very nice contrast to. Good eye! (Hope you're feeling OK). Virkelig et lekkert bilde. Bravo! hahaha, your title tricked me! I was definitely expecting a bird :))), but this machine it's also fine :))! Hola, te acabo de conocer. Muy buenas imagenes. Un saludo desde Murcia..seguimos..
Stilig! Majestetisk konstruksjon. Himmelen er flott, men jeg stoler ikke helt på den, skal det klarne opp eller hva? Ha en fin helg, Rune! Hi Rune! Sorry for the delay; Happy New Year! Great pictures, great story, great job in here, GREAT BLOG, you've got all my CONGRATULATIONS and maximum respect, Robert from Ploiesti, Romania !! !